If you learn ONE recipe only, learn this one. 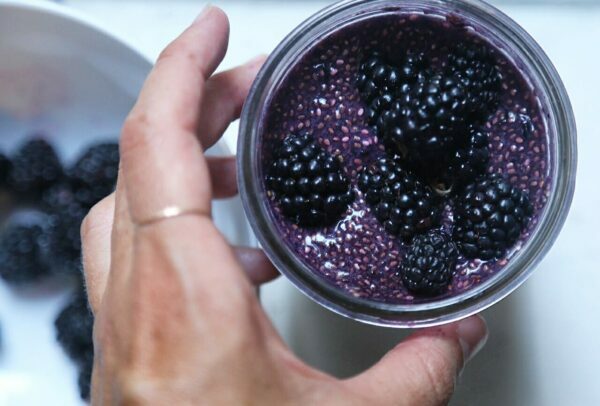 Chia pudding is so simple, easy to take on the road, and actually pretty filling. Here’s an extremely basic recipe using blackberries. You can swap blackberries for any other berry (I love using a mix of raspberries, strawberries, and blackberries). Pour into a glass jar (or container of your choice) and mix in 1/4 c chia seeds. Continue to mix the chia seeds every 2 min or so. The mixture will thicken over time. In roughly ten minutes the chia seeds should be fully expanded and you’ll have your pudding. If it’s not thick enough, just add more chia seeds. It’s important that you continue to mix, otherwise the chia seeds will fall to the bottom and you’ll have a really thick mixture on the bottom and just liquid on top. This isn’t going to be a super sweet snack (just sweet enough from my perspective), so if you’d like it sweeter, mix in a tsp. of raw honey. Refrigerate if you don’t eat immediately.